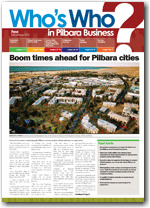 The Who’s Who in Pilbara Business is released in the middle of each year, designed to promote the best of business in the Pilbara. This is a joint publication between the Port Hedland, Newman and Karratha chambers, and showcases a wide range of Pilbara businesses. The Who’s Who is distributed in print format across the Pilbara, and you can also browse the Who’s Who online (thanks to our media partner Market Creations).